I was listening to a feature on Radio four this afternoon on the way back from work. It was an unexpected programme extolling the virtues of Stan Laurel's and Oliver Hardy's film career, as discussed by our very own national treasure - Kenn Dodd. Yes, he is still alive. Although their career spanned the 1920's, 1930's and even the 1940's, their popular black and white films were endlessly featured on our family television through the early years of my 1970's. 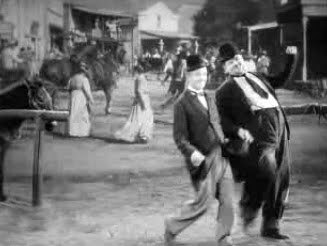 The Laurel and Hardy song known as 'The Blue Ridge mountains of Virginia' was performed as a duet in their 1937 film Way Out West, and this was played as part of the radio show. It brought back so many childhood memories I had to share it through this YouTube clip. I hope that you enjoy watching it as I did listening to it.